Every three months I sit down and take stock of my business. What I’ve done, where I’ve been, what’s worked and what hasn’t. I put it all down in a quarterly business report. If you want to know how much money I’ve earned this quarter, you can do here. Again, I did a lot of travelling this quarter, mainly because there’s a smog issue in Chiang Mai at this time of year. 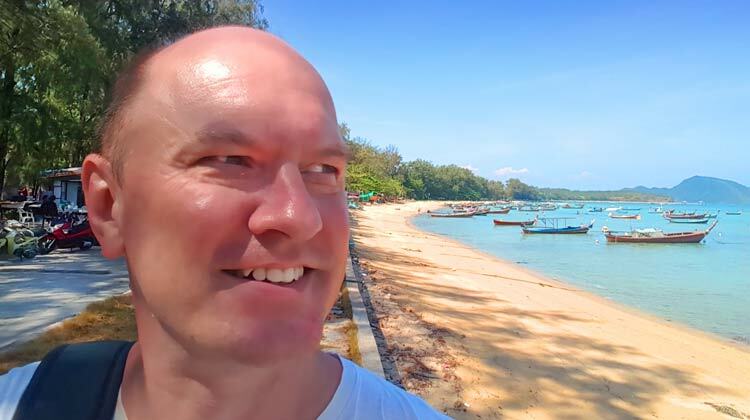 I’ve been mainly in Koh Samui, Phuket and Bangkok – all in Thailand. Enough of the lifestyle stuff, what have I actually achieved in the last 3 months? I’ve moved all my lists from Aweber to Active Campaign – wow, this really was a biggie. OK, I didn’t do it. I outsourced it. Finished a stupid amount of client work – even though I outsource of all this, it still took a ridiculous amount of time. Started to sell my first physical product on Amazon.com – annnd, there’s a lot to say about this. Traveled a lot – met some ridiculously amazing people. OK enough already! IMPORTANT: Since writing this I’ve been having problems with Active Campaign. I’m turning off their affiliate link and I’m not actively promoting them until they’ve sorted out some of the issues I’ve been having. Tag subscribers within lists – instead of having a multitude of different lists as I did in Aweber (for example, 15 buyers lists!) I can have one buyers list where subscribers are tagged with the products they’ve bought. This allows more precise targeting. Copy automations – if you have multiple auto-responder sequences and are similar in someway you can copy them. This is going to be so helpful for me. In making this change I’ve completely re-structured by email lists. I now have three main lists for this blog. This shows you the “pyramid” of subscribers to my site. (OK, it’s an upside down funnel!). The object of doing this is very clear. I want to move people up the pyramid from visitor to subscriber to buyer. 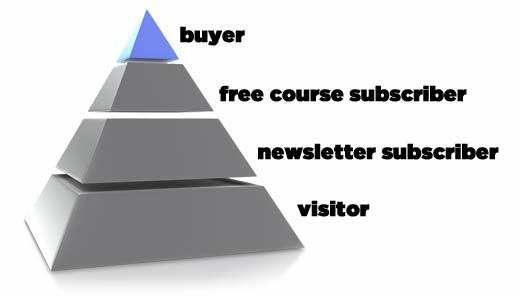 Only here I have an extra subscriber “layer” of the pyramid which is the subscribers to my free courses. These people may not have bought from me but they are more engaged. They have taken (or want to take) one or more of my free courses and I have their first name. I’m especially proud of my free courses offering now. Not only because I offer 6 free courses, which is kinda cool even though I say so myself. 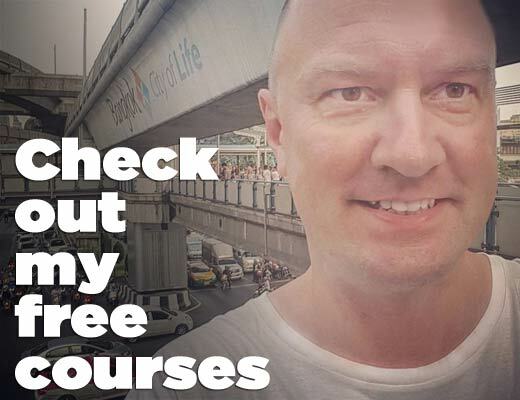 But also, the subscribers to the free courses are tagged depending on the free course page that they subscribe on and then they are put through an auto-responder sequence depending on their preference of free course. Check it out. You can’t subscribe on the main free courses page, you can only subscribe on the page belonging to the free course you click on (giving me info about your interests). Aweber counts an email against your limit every single time an email goes onto another list. So you feel like you’re paying for email address two or three times with Aweber. Active Campaign doesn’t do this – you pay per email address. Aweber puts single opt-in lists on 2nd tier IPSs. Active Campaign does not so I should get better deliverability for my single opt-in lists (I haven’t noticed this yet though). Aweber doesn’t allow you to use conditional code in your emails. Active Campaign does. I really feel like a complete n00b with Amazon FBA even though I’ve been living and breathing it for 6 months. It seems like the only thing I’m able to do in this area is spend money. And that doesn’t make me feel good. Another thing I don’t like about it is the lack of transparency amongst Amazon FBAers. There are good reasons for this. At the moment I’m not telling you the product or the brand. Maybe I will one day. So far all I can say about Amazon FBA is that it’s cost a bit of money to get started. Particularly as I’m sourcing the product from the states and my first inventory shipment is of 500 units. So is that it? Noooo, not so fast, sunny! There is also Amazon PPC – their ads which enables me to put my product in a prominent position on Amazon’s search, product and category pages. Not to mention the $1 promo codes I’m giving out in order to get those all-important 4 and 5 star reviews. Is it worth it? Well, I still think so. I can certainly see myself getting on the first page for my main keyword at the end of this moth or the beginning of next month. If I do that I can see more organic sales coming in. Don’t let these figures put you off Amazon FBA. It’s perfectly possible to get started with a fraction of this money. But you do need something up front. Well, hang out the flags, I’ve only gone and hit the traffic target! Unfortunately that’s not because Google has finally fallen back in love with this site. That is probably because of emails coming to the site from Udemy educational announcements as well as my own emails. These can add thousands of visitors a month. Apart from that, my traffic comes from organic (Google) 49%, social 9%, referrals 12% and directs 23%. Start selling two products on Amazon FBA. ? Target Missed! Well, that was ridiculously enthusiastic. I will try to have a second product in the Amazon store by the end of the second quarter. Make at least $2000/month passive income on Amazon FBA. ? Target Missed! Not to be losing $2000 in the first month would have been more realistic. Create another video course. ? Target Missed! Nope, but I’ve been invited on a collaboration with a few other successful Udemy instructors though. Re-publish one Kindle. ? Target Missed! I wanted to re-write my How To Sell Video Courses Online: How I make $2000+ passive income every month (not least because I now make $5000 a month and have been for over a year) but I didn’t get round to it. And I’ve also started to write a new book. D’oh, shiny object! Make over $6000 this quarter on my membership site. ? Target Missed! H’mmm that would have been nice. In actual fact I made less than $2000. I always add these indicators to my business report. It’s great to see my Facebook Page benefitting from the tactics I learned in Steven Aitchison’s Your Digital Formula course (affiliate link) that include how to create image quotes to increase Likes on your Facebook Page. As you can see, I’ve added a few new indicators at the end there. I’m pleased to say that I’ve added another $100 monthly recurring donation to the list. I’m donating $100 a month now to MOAS. The Migrant Offshore Aid Station (MOAS) is a charity dedicated to saving lives of migrants at sea. They do a lot of work, as you may imagine, in the Mediterranean, as the crisis in Syria has caused many people to risk their lives to get to Europe. Even before the Syrian crisis, however the Mediterranean had seen many migrant issues and fatalities. And they also work in the Andaman Sea where people from Bengal and Myanmar regularly travel to find work in Indonesia, Thailand and Malaysia. This Andaman route has seen many migrant fatalities in recent years. Great that this charity does work in this part of the world (SE Asia). Why don’t you lock in some charitable gifting into your business? Follow the above links as I’m sure they’ll love to have your support. Why do I publish the charitable donations given by my company? Showing off again, Rob? I was inspired by a Smart Passive Income podcast by Pat Flynn with Dale Partridge of People Over Profit. I just couldn’t do it. I was planning to spend more time with my mother than I actually did. It was cold, I got ill and, at the end of the day, I have more friends and have more fun in Thailand than I do in the UK. So I left old blighty half way through February. It’s a wonderful privilege to have experiences all year round that some people save up all year to enjoy for just three weeks. At the moment, I’m minded to make the most of it while I still can. My first world problems (really of my own making) are that I’m not exercising, meditating or eating as well as I had been in London. Now that I’m in Chiang Mai, I’m hoping to put that right. 44º celsius today so I didn’t get round to running. I hope these business reports help other entrepreneurs, business people and those starting out. They certainly help me monitor my improvement or lack of it. The next three months will be critical for my business as we’ll be better able to see if Amazon FBA is worth the time and money investment or not. Stay tuned! Right, I’m off to find the restaurant with the best air-con in Chiang Mai. Thank you, thank you, THANK YOU for doing this post. Ive been striving to incorporate the information from your courses and videos in my own business as best I can (and its been working out GREAT) and i was JUST about to pull the trigger on Aweber as you’ve mentioned that for email marketing in the past. I took a glance at Active Campaign, and it seems comparable enough in features and pricing so ill be checking them out. Hello Yardell, I’m glad you’ve found the information in my courses and videos useful to your business. That makes me happy. Active Campaign is like the next stage from Aweber. When I started out with Aweber it was all the rage but they seem to have fallen behind and everytime they try to improve their service they seem to mess it up. Maybe Active Campaign are better because their software is newer and therefore hasn’t started to bloat yet. But Aweber is still a good option for people just starting out. Hi Nick, I’ll definitely keep you posted. I’m not sure about “single-opt-in lists being relegated to crappier sender IPs” – I only found out about that through one blog and, as I say, I haven’t seen any difference in deliverability between the two platforms yet. Thanks Rob, I love these updates. I still don’t get why these emails services so expensive. I’d love to see an income report from these guys. Nice to see the charity giving. It makes sense when showing your income too. So you can make money from email marketing that’s for sure and I guess that’s why they charge top dollar for their services. The leap to get autoresponders or to able allowed to have affiliate links is a big one when starting something up and you not sure exactly how to best monetize the list. The choice of suppliers is getting overwhelming now and I half expected a price war. Dream on..
Hey, I like the new gravitar! Thank you Rob for this useful and inspiring info! I have 450 subscribers on MailChimp. Do you think it is worth it to transfer them (or only a part of them, but how to choose?) on ActiveCampaign with their 9$/month plan? Bonjour Olivier, hard to answer that one because you haven’t told me what you are doing with your list and what you want to do with it. But definitely don’t split one list between two email marketing platforms. No, no, no! That would be too confusing. I’ll be sharing your report both publicly and privately. This is a great service you are providing others. Have you looked at ConvertKit, I am trying them out and wonder how it differs to Active Campaign. Sorry, Lori, I didn’t look at ConvertKit. Active Campaign worked for me in terms of pricing and features so I went for it. Hmm, you missed all business targets and are still alive? Haha, I’m used to missing targets! Rob, you’re really doing great! I’ve tried my hand at this online income thing multiple times in the past and am trying to do it right this time. Despite my failures, I have always enjoyed your website and your work. Keep it up! Thanks, Andrew, I think sticking to something for a few years really helps. Thank you for coming back to my website I hope you continue to return many times in the future. I’m annoyed with ActiveCampaign at the moment, Bobby. The site works slowly in Thailand (all the servers are in the US), there’s poor UI and their support has a real arrogant attitude. There are benefits over Aweber but at the moment they’re not justifying the effort needed to swap.